Villa il Corso , stands 850 metres above sea level and is surrounded by flowers and chestnut woods. 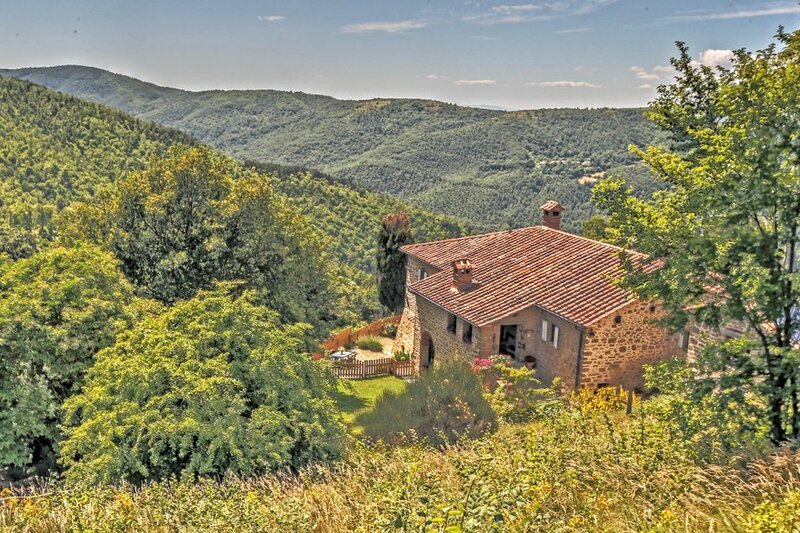 The villa is situated in upper Valtiberina, at the border between Tuscany and Umbria. The Villa composes of 3 appartaments . The owner , a couple of italians, live on the property. They respect your privacy and are available in case of need. Il Seccatoio House – sleeps 5 . is built on one floor and measures 60 square feet. The apartment composes of kitchen, 1 double bedroom, 1 double bedroom with loft with a single bed and 1 bathroom with shower. The kitchen is well equipped with a gas hob, electric oven, dishwasher, fridge-freezer and coffee machine. For those of you who like to bring their pet, the apartment also has its own fenced in garden to keep the pet secure, and there you can find a table and barbecue. Il Fienile House measures 60 square feet. The apartment composes of kitchen, 1 double bedroom, 1 double bedroom with two single beds (+1 ) and 1 bathroom with shower. Casa la Loggia measures 60 square feet. The apartment composes of kitchen, 1 double bedroom ( + a cot for baby ), 1 double bedroom with two single beds and 1 bathroom with shower. At your disposal is a marvellous panoramic swimming pool , a children's playground and a volley field . Chef, breakfast and dinners, cooking course, babysitting, car rental, transportation services from/to airport, mountain bike rental, meditation classes , upon request. The Villa is 5,5 kilometres from Lippiano , climbing up to the hills. The last 2 kilometres is white road. The spot is perfect for those who love nature and privacy. Guests can attend sahaja yoga classes for free.